The People Smuggler by Robin De Crespigny has been awarded the non-fiction prize in the first Queensland’s literary awards without government funding. Veteran author Frank Moorhouse took out the fiction award with Cold Light which is set in Canberra in the 1950s and revolves around a diplomat with a cross-dressing husband. The People Smuggler is the story of Ali al-Jenabi who fled Iraq for Indonesia after being persecuted by Saddam’s regime then set up a people smuggling operation sending more than 500 refugees to Australia. He was arrested by Australian Federal Police and jailed and currently lives in Sydney on a bridging visa after being refused asylum. 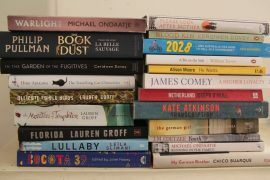 The “official” Queensland Literary Awards were controversially canned by in-coming State Premier Campbell Newman as a cost-cutting exercise but were rescued by donations and industry funding. Whilst acknowledging that Queensland needed to prune its budget spending after devastating floods fuelled its overall economic woes, many people through scrapping the prizes to save $240,000 was an odd and unnecessary place to start. Among other winners were Simon Cleary who took out the People’s Choice for Closer to Stone; Sue Smith who won the TV Script Award for Mabo, about Aboriginal land rights campaigner Eddie Mabo and Bill Gammadge who won the History Book Award for The Biggest Estate on Earth: How Aborigines Were Made.